The modern world view, marked by a suspicion of anything not empirical, skeptical to the possibility of transcendence or mystery, is our age’s default perspective. What exists beyond the data points of observable human emotion and action? Our society has no answer. Modernity is the air we breathe, the language we use, the habits we form. I see the effects in my students, who have been exposed to very little in our culture that encourages them to consider matters of the spirit or develop a sense of wonder. They have nothing more than a superficial understanding of concepts like good, evil, grace, sin, freedom, mercy. Considering metaphor is an unnatural exercise, and they are reluctant to bequeath the terms “true” or “real” to any experience not potentially viewable on Youtube. I’d argue that this modern perspective, hostile to mystery and unwilling to concede the primacy of the self, is the number one obstacle facing Catholic educators today. How best to awaken students’ sensibilities to transcendent things, to the soul, to what Catholics—and most religions—consider most real? 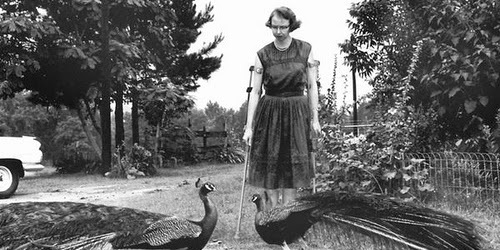 The genius of Flannery O’Connor was that she left many of the cultural distinctions cherished by Catholics of her age out of her work, recognizing that they were not related to truth. Instead, she made work that crossed borders—between North and South, black and white, Catholic and Protestant, the realistic and the grotesque—in order to dramatize the central human question: the question of “the salvation or loss of the soul,” as she put it. If O’Connor can be said to write about any “region” at all, Elie says, it is “the periphery,” the edges of society. The characters that populate O’Connor’s periphery are instantly recognizable to any who have encountered her fiction: traveling salesmen, amputees, violent criminals, tattooed carneys. In the tradition of the grotesque, O’Connor took the habits and people of the South, so familiar to her, and stretched them so that they were distorted to the point of caricature. As Joyce Carol Oates points out, unlike much modern fiction, where things only seem to happen inside the confines of characters’ minds, the hulking freaks and violent catharses of O’Connor’s world occupy an undeniably physical realm. Why use the grotesque? O’Connor believed that modern society had rendered her readers “almost-blind” to matters of the spirit, so she dramatized the aspects of the human soul in a way that her audience could clearly see them. In other words, she pushed her characters to the periphery of society so that they would be noticeable, which is exactly what Elie witnessed in his African travels. It was not just O’Connor’s South that he recognized—it was the human soul, on display in a manner rarely seen in our sanitized first world (is it called the “Global North” now? ), outside of art. That art, for O’Connor, was largely informed by her Catholic vision of the world. Her stories are sacramental, in that her primary goal is to make visible the invisible mysteries which faith considers most real, putting the regions of the human soul on display in figures whose distorted appearances startle yet do not estrange us. Her stories yoke the physical and supernatural, as if they have one foot in this world and one in the next. On the other hand, if the writer believes that our life is and will remain essentially mysterious, if he looks upon us as beings existing in a created order to whose laws we freely respond, then what he sees on the surface will be of interest to him only as he can go through it into an experience of mystery itself. His kind of fiction will always be pushing its own limits outward toward the limits of mystery, because for this kind of writer, the meaning of a story does not begin except at a depth where adequate motivation and adequate psychology and the various determinations have been exhausted. Such a writer will be interested in what we don't understand rather than in what we do. He will be interested in possibility rather than in probability. He will be interested in characters who are forced out to meet evil and grace and who act on a trust beyond themselves–whether they know very clearly what it is they act upon or not. To the modern mind, this kind of character, and his creator, are typical Don Quixotes, tilting at what is not there.